Have you ever heard of the “Hole Stone”? Probably not, unless you’ve been paying close attention to legends arising out of Northern Ireland. Our Belfast guide James (AKA “Wee Jim”) recently shared this story on our Facebook page. We were intrigued and asked him for a photo of the “Hole Stone”. He obliged, and we’re now sharing this local legend with you. The hole stone sits on a “fairy hill” in the townland of Kilbride off the Holestone Road. Years ago, the Druids used the stone to marry people. They would do this by having the couple walk around the hill three times: once for the past, once for the present, once for the future. The couple would then climb up to the stone and the girl would place her hand through the hole in the stone (the hole is slender and only fits a woman's hand). The young man takes the girl's hand from the other side of the stone. They say their vows to each other and that is the deal: struck in stone and old magic, never to be broken. Today local people still use the stone to get engaged. When you visit the stone you will always see flowers placed there. Antrim has many holed stones, more than any other County in Ireland. This type of stone, known as an Oath Stone, was used for making deals. (Some describe them as being like an ancient credit card!) You could also buy cattle or land or perform any kind of deal here if you simply placed your hand on the stone and swore an oath. Until the eighteenth century, a promise given at the stone was enforceable by Celtic law. 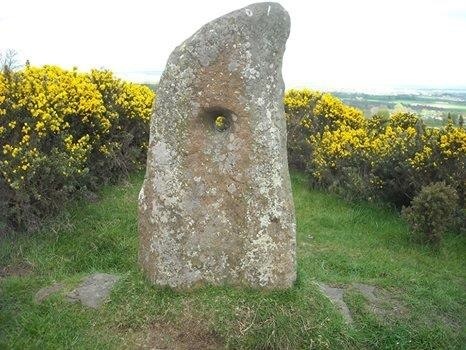 Thanks for sharing the legend of the Hole Stone, Jim! Any travelers headed to Belfast and the surrounding area this fall or next year would be well advised to contact Jim for more stories, sights and Irish experiences you won’t find from the back of a tour bus.